I haven't been blogging as much lately, and I've been completely exhausted. Being a new mom has taken a toll on my body, and no matter how much sleep I actually get, I'm still tired. I have been making a point of eating fairly healthy, but still feel fatigued. I just assumed I was tired due to being a new mom with a baby, but what else could be causing it? Last week I had my annual checkup at the doctor, and I got some of the results back yesterday... I have a severe iron deficiency. Yes, I'm anemic and it's the worst it's ever been. I've been anemic in the past due to the gastric bypass, and have had issues of trying to bring my numbers up to par. I try and take iron pills, but noticed that my body doesn't really absorb them like they should. My doctor is introducing me to a different kind of iron supplement... FeraMAX. It's a powdered water soluble Polysaccharide-iron complex... basically it tastes like grape juice crystals. So What is Iron Deficiency Anemia? 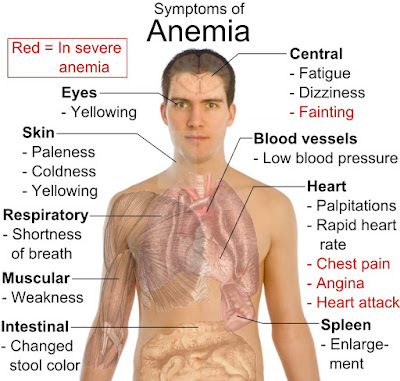 Anemia is when you have a level of red blood cells in your blood that is lower than normal. Iron deficiency anemia is the most common type of anemia, and it happens when your body doesn't have enough of the mineral iron. The body needs iron in order to make a protein called hemoglobin. This is responsible for carrying oxygen throughout the body, which is essential for your tissues and muscles to function properly. If there isn't enough iron in your blood stream, the rest of your body can't get the amount of oxygen that it needs. Even though the condition is quite common, many people don't realise that they have the deficiency. It's possible to experience the symptoms for years before knowing the cause. When woman are at the childbearing age, it's very common to have iron deficiency anemia. The most common cause is a loss of iron in the blood due to heavy menstruation or pregnancy. A poor diet as well as some intestinal diseases, can affect how the body absorbs the iron, which can also cause the deficiency. Doctors will normally treat the condition with iron supplements, and/or changes to the diet. In women of childbearing age, the most common causes of iron deficiency anemia are heavy menstrual bleeding and blood loss during childbirth. Certain medical conditions can cause internal bleeding, which can lead to iron deficiency anemia. Examples include an ulcer in your stomach, polyps (tissue growths) in the colon or intestines, or colon cancer. Regular use of pain relievers, such as aspirin, can also cause bleeding in the stomach. Certain disorders or surgeries that affect the intestines can also interfere with how your body absorbs iron. Even if you get enough iron in your diet, celiac disease or intestinal surgery, such as gastric bypass, may limit the amount of iron your body can absorb. Iron tablets can help restore iron levels in your body. If possible, you should take iron tablets on an empty stomach, which helps the body absorb them better. If they upset your stomach, you can take them with meals. You may need to take the supplements for several months. Iron supplements may cause constipation or stools that are black in color. Additionally, vitamin C helps your body absorb iron. If you’re taking iron tablets, a doctor might suggest taking the tablets along with a source of vitamin C, like a glass of orange juice or citrus fruit. When caused by inadequate iron intake, iron deficiency anemia can be prevented by eating a diet high in iron-rich foods and vitamin C. Mothers should make sure to feed their babies breast milk or iron-fortified infant formula. So now I know why I'm always a zombie in my daily life. Hopefully within the next few weeks of some serious changes, I'll start feeling a difference. I will keep you all posted, and let you know if there's any improvement!